I could not be more excited to present this post by guest blogger Lynette Vann. Lynette and her family are from the States but live and cycle overseas, currently in Kazakhstan after some years in Malaysia. Many thanks to Lynette for sharing this post with us and I hope we get to learn more of her family's bike riding ex-pat adventures over the years. You may contact Lynette directly here. Last month, we were at the end of our first full family bike-to-school morning. We’d had a lovely ride despite some wet, cold, and muddy conditions. I was so proud of my oldest daughter who had left the nest/cargo box and was riding on her own. We turned off of the highly protected pedestrian path to finish the ride on two blocks of city streets that also happen to lead in front of my husband’s office. Everything was going great. It was a bit muddy and sloppy but we were holding tight in form with the bakfiets shielding our young solo rider and my husband bringing up the rear. The work buses were plowing down the street, there was some morning traffic honking and jostling but we were doing it and then I heard my husband mutter, “I like to ride but I don’t want to parade.” Oh, so quickly did my spirits sink and all of our calmness in the traffic slipped away and before you know it the last block was a miserable, stop and go, bump into each other slog into school. The girls didn’t seem to notice it and all in all it was a tiny hitch in our ride to school morning but it got me thinking about parades. Let me introduce myself. I’m Lynette. Mom to two lovely little girls, A (4) and L(6). We’re an American expatriate family that recently moved to Kazakhstan with my husband’s work after living four years in Malaysia. 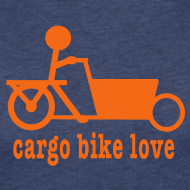 And we love bikes. Always have. We started biking as a family when L was six months old. Our fleet of bikes has grown and changed along with our children. We started with one Burley trailer, then two trailers for an additional child or touring gear, then the Bakfiets, next a family touring package with coupled bikes and tagalongs, then a Babboe Bakfiets, and, finally, a Surly Xtracycle is soon to arrive. It’s been an evolving process. We’ve done a lot of things well but generally only after lessons learned from some pretty horrible rides. We've done unsupported family touring through Australia, Portugal, Spain, and our favorite, New Zealand - three times in the winter! With our new location we hope to do more touring through Europe. But what really keeps us going is the day-to-day biking. Here in Kazakhstan we aren't allowed to drive so it's a bit of a necessity for maintaining some personal freedom. So we bike. We bike to the grocery, the market, the parks, the coffee shop, and our friends’ houses. We bike to explore, to play, to relax, and to burn off some frustration when I can’t remember my Russian numbers at the market. And, as in all the other places we've biked in, we find that biking with kids generally brings out the best in people and opens doors that were not previously visible. A frosty woman's face automatically brightens and opens and we find ourselves talking in broken language for five to ten minutes with her on the street as she tries to figure out how the bakfiets works. The husband and wife at the fruit stand pick out the perfect apple for the girls while they sit in the bakfiets so the girls don’t have to unbuckle and buckle again. The old man who follows me for a block and then watches to make sure I lock my bike up. Giving me a thumbs up when he deems it secure. We are on parade. We are on parade because we are foreigners in this country. We are on parade because we choose a form of transportation that is uncommon. And at different times in our family biking life we’ve had to tackle the uneasiness that comes with being on parade. 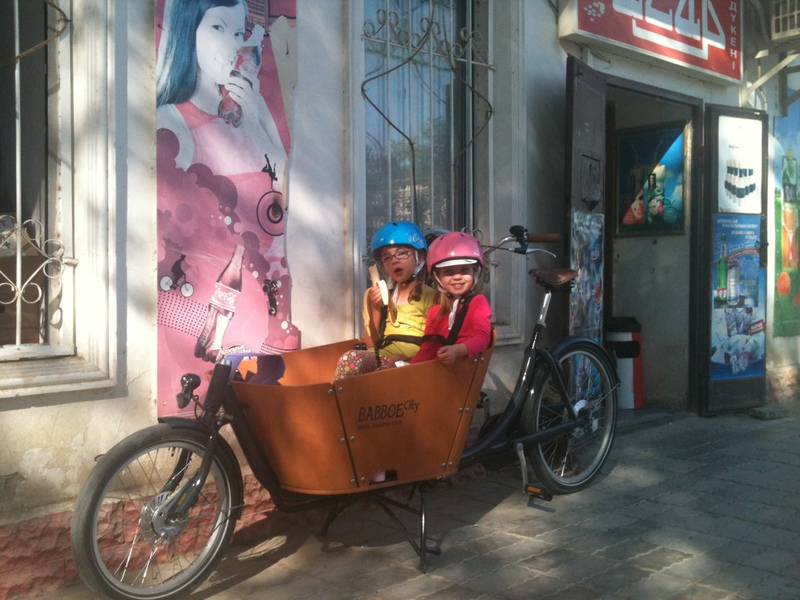 There are detractors everywhere, many towards biking in general but more towards biking with children. Sometimes those detractors even come from the inside the family and, now quietly, sometimes even me. But one of the joys of riding together is that on the day that I don’t feel like parading, my husband might, or my daughters might. The family ride pushes us to let go of some of the parental paranoia so we don’t pass that baggage on to our girls who see it as an adventure – helmets properly adjusted and strapped, of course. The family ride requires my spouse and I to work together and rely on each other in a way that spouses often don’t have to anymore. The family ride also overcomes detractors on the outside. The woman on the street, the couple at the market, the man on the path? These four people in my town were strangers who I’m certain wouldn’t have normally paid me any attention; these four now watch for us on the path, at the market, and on the street. We’ve fast-tracked our settling period by making connections with our neighbors and townspeople. Which is great wherever you live but particularly great when your home is in a foreign land. So we sit up tall with our helmets on snug and the girls return the waves of people as we pass by. I love a parade. And I’m pretty certain you would too. 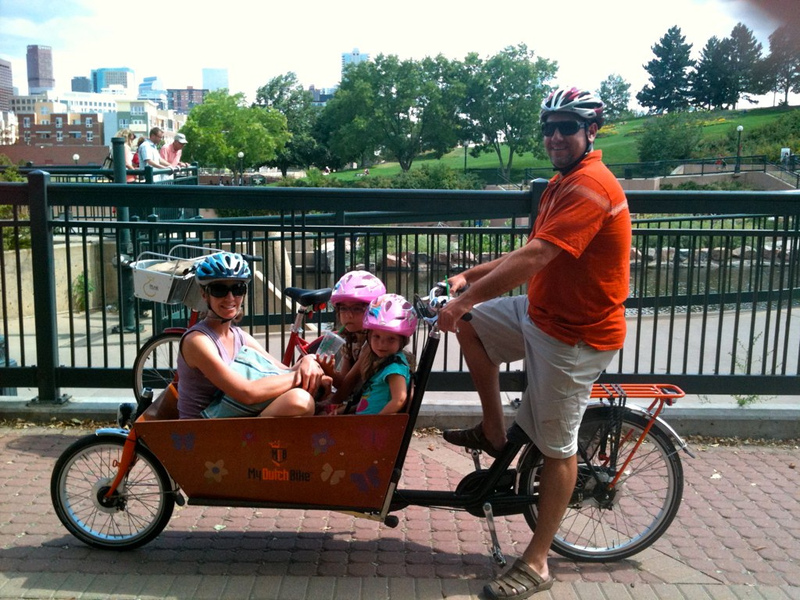 Author Lynette Vann and her family with their Dutch Bakfiets back in Colorado for vacation. Great guest blog post! This post reminded me of cycling through one corner of Ireland when I was in college and the many positive encounters I had with people because I was on a bike and not in a car or a bus. I know being encouraged to bike when I was a kid certainly set the foundation for being comfortable with biking as an adult and being wiling to rent a bike in Ireland and have an adventure. 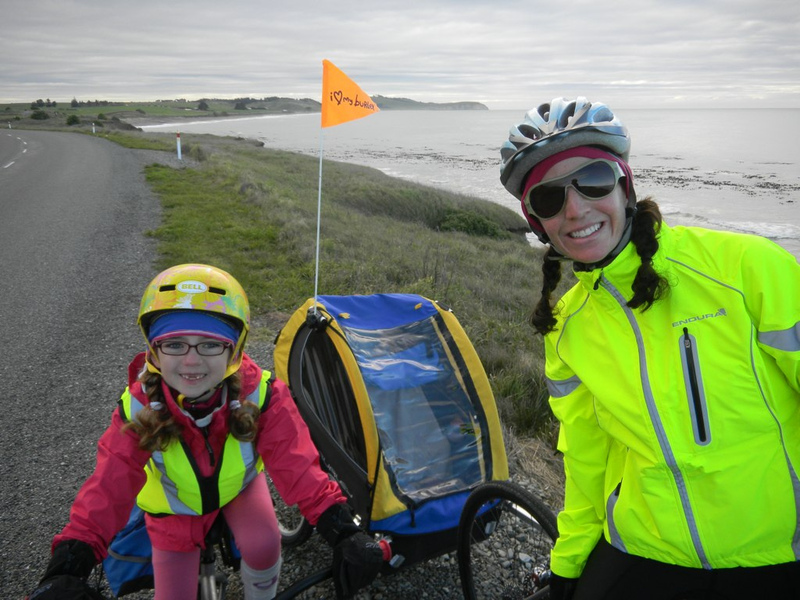 It's great to see families biking together! Glory be the family cyclist! I loved this. Not only because Lynette is my sister, but because as always, she inspires me to stretch my comfort zones on the bike as a mom of two little girls. Nice. What a beautiful post. It's already difficult enough to explain that "no, I didn't build this bike" and "yes, it costs more than most bikes" in english let alone in a non-native tongue. Your posted has such a gentle attitude about it. wonderful. I love the idea of sometimes enjoying hte parade and sometimes just not. It seems I always get some car pacing me to ask me questions when I am not feeling it. But I do enjoy Waving freely when I see someone I know. It feels very royal to throw one's hand up and wave crazily at someone passing by. I enjoyed this a lot. I have definitely experienced the stares and mixtures of praise and scorn. I liked the term "on parade" to describe being in the moment on a family bike and feeling all the attention. Lynette, do you find Babboe a good bike? 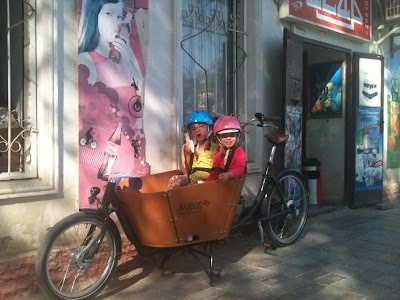 I am considering getting it to bike with my three kids (all under 6 years old). Would you recommend it? Thanks for all the positive comments - it's so nice to share a part of our family cycling story with the full hands crowd! We're looking forward to a holiday trip to the US next week and hoping to decorate the bakfiets for some winter parading there.